According to Engadget, some retail companies are showing off Surface Pro demo units at certain stores in the US. The 9th of February is quickly approaching and for Microsoft, it could be the start of their real movement in the tablet world or another failure that forces them to recline and think over their plans. The original Surface, running Windows RT, was nothing short of a failure. Microsoft dare not speak about the tablet, never mind try to talk about all the advantages of getting a Surface RT. Now they will bring their PC-type model, running full Windows 8 Pro and sporting an Intel i5 processor. 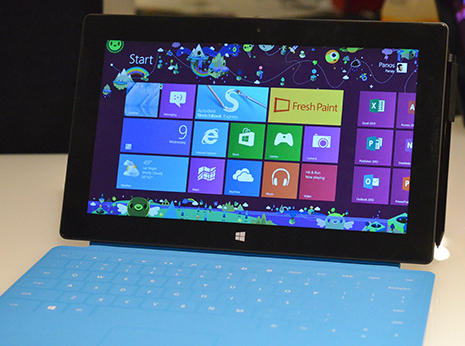 Every sense of the Surface Pro says PC, apart form the form factor, which is almost identical to the Surface RT. Microsoft is apparently allowing retail partners to show off Surface Pro demo units a week before the original launch date. We aren’t sure where these units are being shown off exactly. We believe Best Buy, Staples and Microsoft Stores around the US will be showing off the Surface Pro demo units this week, to build more hype for the tablet/PC hybrid. We suspect the Surface Pro demo units will have some jagged experience, only allowing you to check certain apps. The Surface Pro starts at $899 and with that you get 64GB of storage, or you could add an extra $100 and get 128GB of storage. Rumours are saying that the Windows 8 Pro OS takes up a high percentage of the whole 64GB of SSD storage, so it may be a more suitable option to go for 128GB. Microsoft will be shipping the Surface Pro out to US and Canada first, hopefully followed by a European and then international release. We are unsure if Microsoft will get more sales with this Surface model, with it being $500 more expensive. Hype and love for this model show that it won’t be a silly mistake to buy it. The Surface Pro is fitted with top performance components and excellent software.